I’ve spent opening day in Winner each October for the past twenty years. The first dozen or so were due to the hospitality of Doug Knust, a high school friend whose family owned a couple of quarters of ground east of town. A few years back, Doug and I fulfilled a lifelong dream and purchased that land from his family, and our opening day tradition has been further cemented since then. We meet on our ground around eleven in the morning, parking next a cattail-choked creek that winds it’s way across one of the quarters. Doug and I live three hours apart, with Winner being somewhat in between our homes, and we look forward to our reunions in that field. The attendance varies from year to year, but usually includes four or five additional relatives and friends. Quite a few brothers, daughters, cousins, in-laws, and nephews have joined us over the years. Both of our fathers were regulars on the roster before we lost them. A small memorial on the southeast corner of the field pays tribute to Doug’s parents and the generosity they extended to us over the years by allowing us access to the spot. The pre-hunt banter typically covers topics such as a recently-acquired pickup, or maybe the new shotgun one of us is breaking in. The never-ending debate as to the superiority of the Notre Dame football team over the Cornhuskers is also briefly but enthusiastically touched upon. The accuracy of preseason bird counts is discussed, and it seems that one of us is usually optimistic about a new pup’s potential, or sentimental about what may be an older dog’s final season. Hunting vests are put on, guns are eased from their cases, and the dogs, whining to be freed from their kennels and released to hunt, are watered and collared up. A quick evaluation of wind direction dictates the strategy for our safari, guns are loaded, and with a “Hunt’em up!” command issued to the dogs, we’re off. The majority of our hunting is done on the three-quarters of a mile of creek that traverses our property. It’s consistent running water, thick cover of cattails, and proximity to the adjacent bean and sorghum fields combine for fantastic pheasant habitat. The creek bed varies in width from twenty yards in several spots to two hundred yards in others. The creek’s depth, which runs from a few inches to several feet, is nearly impossible to gauge due to it's running through thick cattails. This almost always makes for some interesting attempts at crossing, usually provided by someone making their first hunt with us. During the typically warm weather of mid-October, the consequence of inaccurate depth assessment is limited to waterlogged boots or pants saturated to the belt. In our hunts later in the season, the spring-fed creek’s water temperature makes for “rotten” ice rarely capable of supporting an adult’s body weight, and the resulting breakthroughs typically mark the end of that individual’s hunt, as they’re forced to trudge back to the warmth of their truck, where they wait in misery for the rest of us to finish. All of us have fallen victim to that unreliable ice a time or two at some point in the past. Dogs are invaluable in that cover. Doug and I are both fond of canines, and have a pickup boxfull of memories of the hunts we’ve enjoyed behind our dogs there. His springers, Dakota, Repo, and Snickers have rooted hundreds of birds out of those cattails over the years, while my pointers have provided us with a similar number of statuesque points. My now-gone partners Axel, Dep, Jack, and Ice all hunted that creek over the years, as my current dogs, Pete and Dodge do now. The opportunity to watch bird dogs do what they’ve been bred to do is always enjoyable, but in the case of our creek, it’s also a necessity as roosters dropped in the waterlogged cattails are all but impossible to find and very difficult to retrieve without the help of a good dog. We’ve also hosted a number of our guests’ dogs over the years. One of the most memorable dog performances I can recall is actually that of a dog owned by my brother. 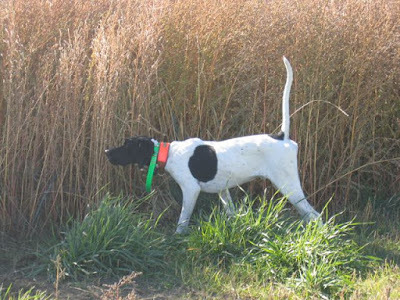 Gus was an undersized black and white springer who compensated for his small stature with a keen nose and impressive work ethic. During a hunt in the creek years ago, a downed bird was not located, in spite of our allowing the dogs to work the area over for an extended period of time. An hour or so later, as our group was enjoying a lunch break around a quarter mile away, Karl asked if any of us had seen Gus. None of us had noticed him slipping off, but as we watched, the diminuitive dog climbed out of the creek bed carrying our lost bird, proudly strutting across the field to deliver the prize to his boss. During good years, we nearly always limit out along the creek. In slower years, we’ll also hunt the two milo strips that our tenant farmer leaves for us, which usually produces some additional opportunities for us. The relatively small amount of ground we have to hunt dictates that we’re finished within a couple of hours, after which we return to the trucks. Once there, we pause for a group photo with our harvest, and then set up some folding chairs and enjoy an hour or so of tailgate time. This often includes a sandwich, candy bar, honeycrisp apple, some of Doug’s deer, antelope, or goose jerky, and a cold beer. Our post hunt conversation is as predictable as our pre-hunt ritual. One of us will brag about his marksmanship, or comment on another’s lack thereof. Someone will lament the waterlogged boots that resulted from that damn creek once again being deeper than it initially appeared. We’ll water and feed our dogs, and evaluate their performances as we scratch their ears and let them know how proud we are of them. Politics will inevitably surface, but given that we’re all pretty much on the same page in that regard, it’s a friendly conversation. We’ll catch up on each others’ families as well as the college football scores posted that day, and reminisce about hunts from years gone by. When the food is gone, we’ll load the dogs and pack the trucks, and while reminding each other of our good fortune in having good ground to hunt, the health to do so, and family and friends to share it with, we shake hands and drive off in opposite directions wearing satisfied smiles, closing the books on another opening day.